The beloved MYWAY Quick E-Scooter has had a good run for the 2014 year. The design of MYWAY by entrepreneur Nimrod Sapir has made this scooter a popular choice amongst the community for obvious reasons. With the recent sneak peak release of their newly updated version of the MYWAY, I was of course excited to see what MYWAY had up its sleeves for the 2015 model. We got to be one of the first ones to test ride the highly anticipated 2015 MYWAY at FALCON PEV , now known as the INOKIM Quick 2. If you don’t know already, INOKIM stands for “Innovative Solutions for the Final Kilometer.” Now, let me share with you a bit about the new and improved MYWAY that make this E-Scooter even more adored. The INOKIM Quick 2 will keep what we most loved about the MYWAY- power, stability, and comfort. It will still offer the 10 inch pneumatic Kenda rubber tires that are larger than the wheels on your average E-Scooter, and can handle bumps and potholes much better. Unlike plastic wheels, they provide better traction on wet surfaces, making your ride much safer. The brakes are still the same front V-brakes and rear disc brakes that allow for more security and control in handling the scooter, and will give you much more assurance than your normal brakes. The INOKIM Quick 2 comes in an assortment of eye catching colors that are much more appealing to the naked eye. Choose from basic colors like Devious Black or Cloudy White, or ride in style on one of the new fun colors- Seascape Blue, Sherbet Orange, or Spartan Green. The MYWAY Company heard your suggestions and added an LCD screen, odometer, and speedometer, along with the battery indicator. 3 gear settings to control your speed- up to 9km/h, 18km/h, or 27km/h. Double throttle- Use the classic thumb throttle to accelerate or simply move by using the twist throttle. The handlebars are also wider allowing for greater handling, stability, and comfort, making it much easier to maneuver. The INOKIM Quick 2 features a carrying handle in the deck for greater portability. And also allows for another place to lock up your scooter. Choose from the standard 8.8AH battery or upgrade to the 18.2AH battery for a longer range. The overall feel of the INOKIM Quick 2 is similar to that of its predecessor, but one will definitely enjoy the new functions the updated version has to offer. ETA is early to mid March. 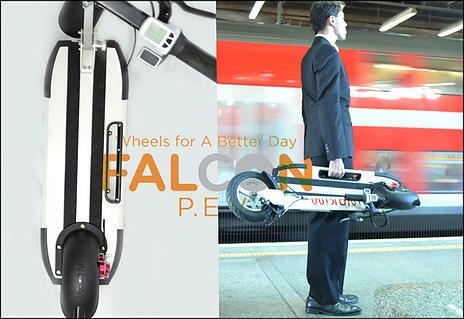 FALCON PEV has it on preorder here for a special preorder price of $2000. Grab it before it goes up in price! Previous: Previous post: Will E-Scooter Insurance coverage make E-Scooter use more acceptable?